Before about the year 2000, most desktop computers used cathode ray tube (CRT) monitors. Liquid crystal displays had been used on laptop computers since the mid 1980s. Color LCD displays have a sandwich-like structure as shown below. One layer of the sandwich has liquid crystal between two glass plates. One glass plate has a matrix of thin film transistors on it. 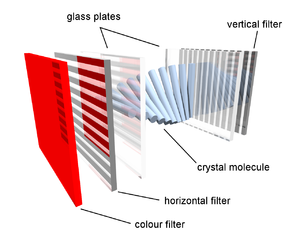 The liquid crystal layer is sandwiched between two polarizing filters, one polarizinglight vertically and the other polarizing light horizontally. Behind the sandwich-like structure is a fluorescent back light. A pixel (picture element) is the smallest component of an image, creating a single dot in the picture. Each individual pixel is divided into three cells, or subpixels, which are colored red, green, and blue by the outer glass plate. To address a particular subpixel, its row is switched on, and then a charge is to the correct column. Liquid crystals move depending upon the charge applied to a tiny capacitor by its related transistor. Each subpixel can be controlled independently to yield thousands of possible colors for each pixel. • How Does Wireless Internet Work? • How does a CD Burner work?